SF-17 is one of the latest additions to CM Storm's "SF" line of cooling pads aimed toward power-hungry gaming laptops. Equipped with a powerful, yet quiet 180 mm fan, SF-17 exhibits excellent cooling performance while maintaining minimal noise levels. The high performance fan can spin up to 1,200 RPM (+/- 10%) for maximum cooling, or lowered to 700 RPM for quieter operation. To compliment the aggressive look of your gaming laptop, SF-17 boasts various red LEDs along its side and a stylish red LED strip along the front. A step less dial on the side of the pad allows you to seamlessly adjust the fan speed based on your needs. SF-17 was designed with long gaming sessions in mind as it features 4 different ergonomic height adjustments, allowing you to angle your laptop for optimal viewing/typing positions. 4 USB ports line the side of the pad for you to attach any additional peripherals you may have. Various cable management grooves are built into key areas of SF-17 to ensure a clean setup. 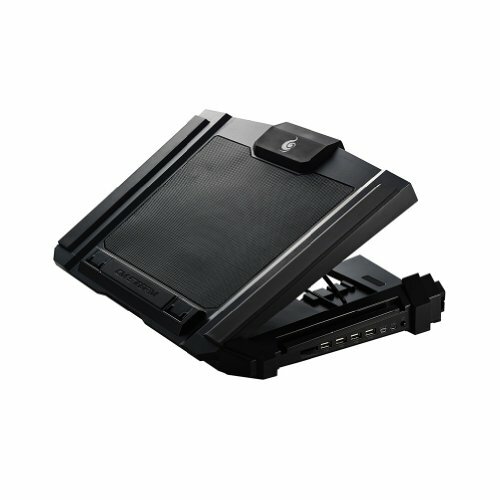 SF-17 is compatible with large laptops with screens up to 19 inches.